This particular vision struck Candice Miller of CM Events, and she spent months bringing together the necessary vendors to carefully curate the picture in her head. The Hill Center, in downtown Washington DC played host as we all came together to celebrate and document Candice’s dream. Amy Lauren Floral Design did a wonderful job with florals, bringing together rich spring hues to lend to the “garden glam” feel of the shoot. Everyone knows what a sucker for details I am, so between Emily Baird Design and Bianca, of A Beyoutiful Fete, I was in complete Heaven. The paper goods were perfect, and with Bianca’s impeccable styling, the details were nothing short the glamourous look Candice was going for. Glamour can be found in simple elegance, a detail not lost on Angela of Angyono Custom Cakes. Her cakes are always spectacular, and the only issue I had with this one was not being able to taste it! 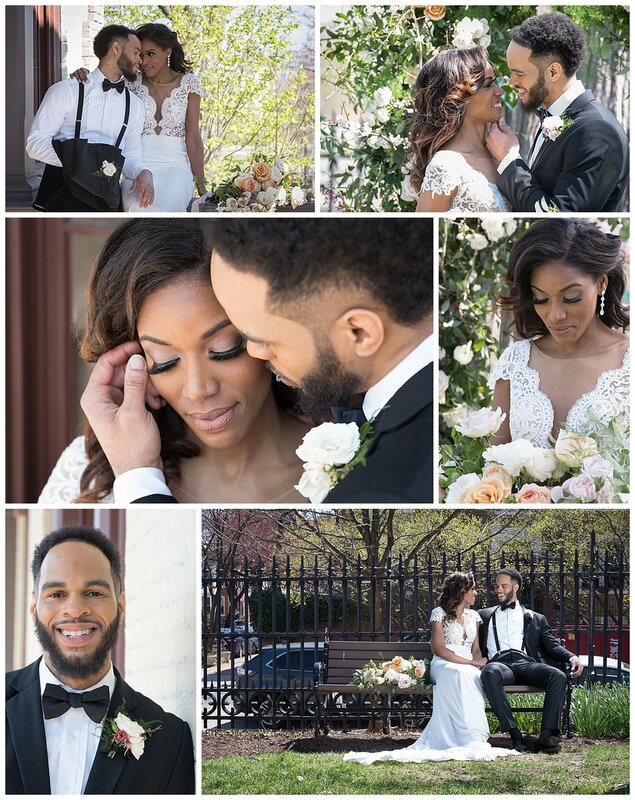 No styled wedding is complete without a gorgeous couple. Ashley and Steve were definitely that. In a gorgeous lace dress from White Swan Bridal, and a suave tuxedo from Generation Tux, Ashley and Steve wowed us all afternoon long. Bringing a beautifully polished look to their already flawless skin, Renata Lynette Makeup is certainly a wizard when it comes to hair and makeup. Click here to see the full gallery of images, or watch the slides below for some of our faves! There is a complete list of vendors below the slideshow!